Ryan Gosling as a young Willy Wonka? Don't get your hopes up (or don't get too upset, depending on how you feel about it) just yet, but it sounds like the 36-year-old Oscar nominee is interested in taking on the role made famous by the late, great Gene Wilder. 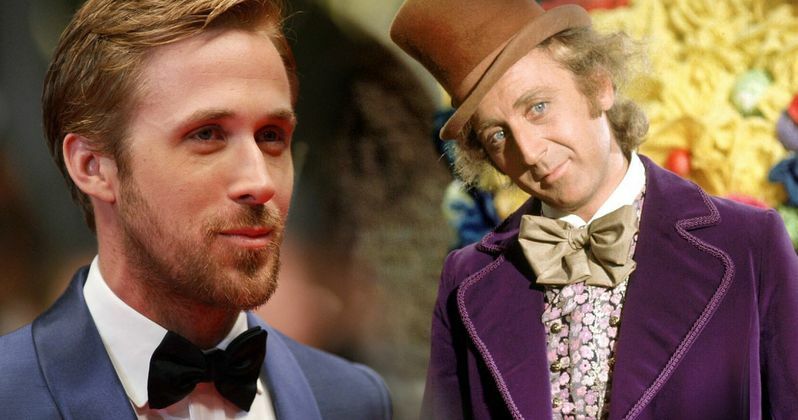 Warner Bros. is planning on making another movie centered on the singing, dancing candy making man and, if this new rumor proves true, Gosling may be the next great actor to try and portray the character on the big screen in the planned Willy Wonka Prequel. In case you hadn't heard, Warner Bros. is currently working on another movie based on Willy Wonka, the character from the Roald Dahl book Charlie and the Chocolate Factory that the studio secured the rights to last year. No details have been released by the studio, but it isn't going to be a remake of Willy Wonka and the Chocolate Factory and, at this point, it sounds like we are going to get some sort of prequel. Now, thanks to the folks at That Hashtag Show, the news of Ryan Gosling's potential casting has come to light. Here's what they have to say about it. "Warner Bros. is currently looking for a male actor between the ages of 29 and 35. Ryan Gosling is currently in the lead as he has expressed interest in portraying the infamous chocolate factory owner." This report also reiterates that the movie will be a Willy Wonka prequel that focuses on the character meeting the Oompa Loompas and their early adventures. Since most people didn't take too kindly to Tim Burton's Charlie and the Chocolate Factory, which saw Johnny Depp playing the iconic candy peddler, it makes sense that they wouldn't want to just do another remake. As far as Ryan Gosling goes, he is just a tiny bit older than the report says they are going for. But he is a very in-demand and talented actor. Given the success of La La Land, Warner Bros. would likely be willing to overlook that minor detail. Roald Dahl wrote two different books featuring the character of Willy Wonka. The first being 1964's Charlie and the Chocolate Factory and 1972's Charlie and the Great Glass Elevator. He didn't ever write a book about Willy Wonka on his own, so this new movie won't have any source material to adapt directly. Charlie and the Chocolate Factory was adapted for the big screen twice. First in 1971's Willy Wonka and the Chocolate Factory, which featured the late Gene Wilder as Willy Wonka and is considered the much better of the two adaptations. Tim Burton's 2005 take, though financially successful, is not generally as well-liked. Related: Willy Wonka Origin Story to Be Revealed in New Prequel Movie? This report hasn't been corroborated by anyone at Warner Bros., so it should be regarded as rumor for now. Plus, things have been a little quiet in regards to this new Willy Wonka movie for a bit, so the project is probably still a ways off. But if Ryan Gosling signs on, that could be the thing that gets this train really moving down the tracks. We'll be sure to keep you up to date as more information is made available.